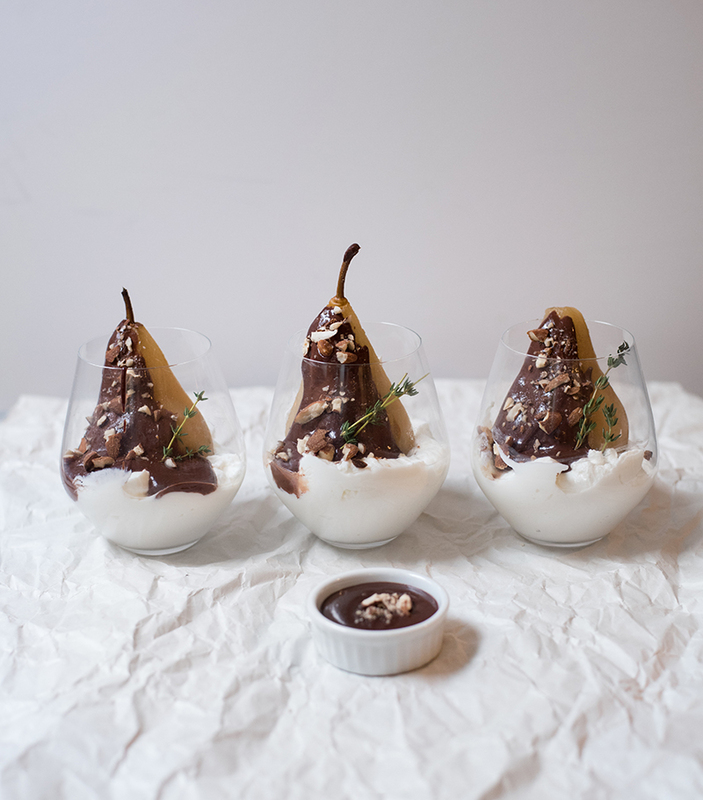 This Poached Pears with Chocolate Sauce is a great winter recipe, although I'm not sure what season we're in right now. It's been a lackluster winter - cold and full of rain but no snow. In my opinion, if it's not snowing, then enduring the cold is pointless. I still love snow because it's a dream to photograph, and I don't have to shovel any yards or drive to work, but I know B is less enthused about snow since he has a longer trek to work. I really enjoy pears but somehow only eat them during the fall and winter, even though they're available year round. I ate way too many bartlett pears during college so I don't like them anymore (plus I find them mushy in texture), but I'm still fond of bosc pears. I haven't had too much time for baking, but poaching is a quick and easy way to make an elegant dessert. 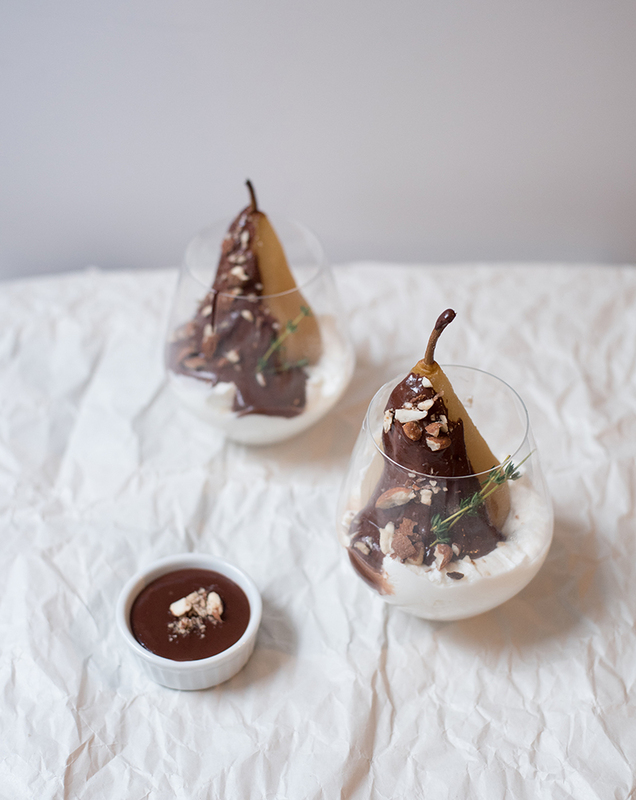 I was first inspired to make poached pears after having them as a dessert in one of New Haven's restaurant week, and this is now my third poaching recipe (see my mini pear almond tart and maple poached pears)! Poaching infused whatever flavor of you use for the poaching liquid and while wines are popular, I like the cider for some sweetness. 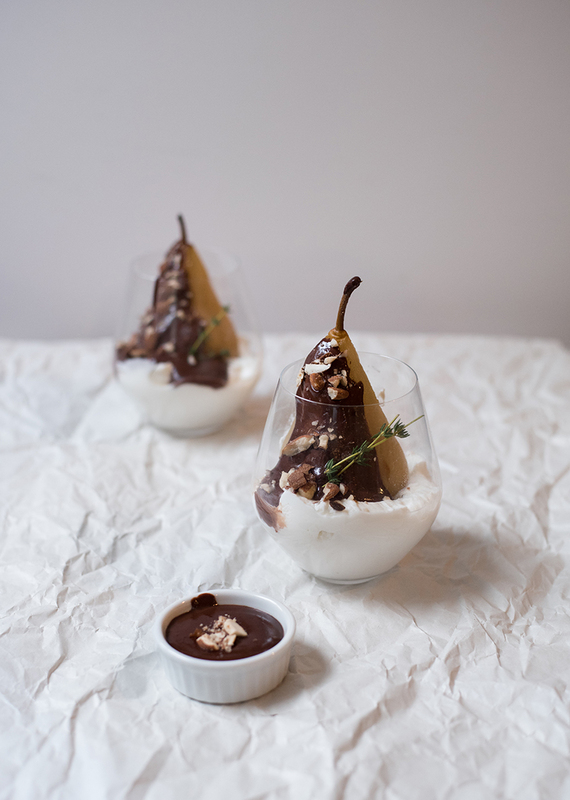 Pears and chocolate are a less common pair (no pun intended) but it's wonderful with ice cream or yogurt. Recipe adapted from Tartalette Blog. 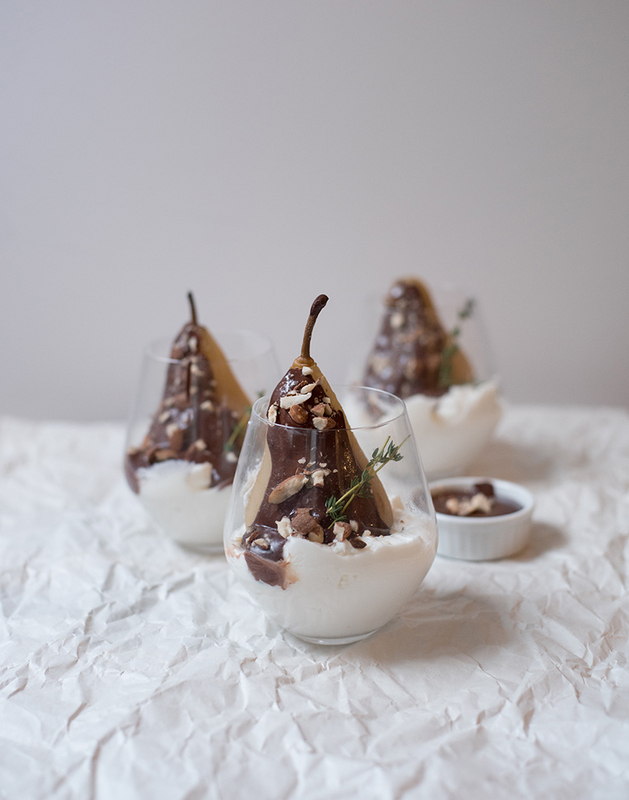 Enjoy these Poached Pears with Chocolate Sauce for a date night or a fancy dinner event! I meant to make these for Valentines day with B, but I ended up eating them all, so B never got to see them. 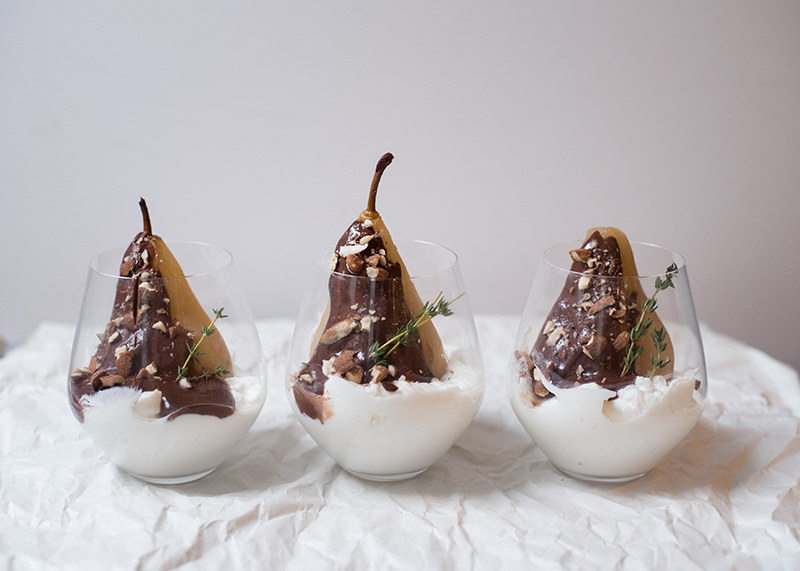 Also, pears are some of my favorite foods to photograph. The shape is so elegant. In a large saucepan with water, add your apple cider, cinnamon sticks, and pears. Simmer over medium-low heat for about 15 minutes, turning pears, until pears are tender but firm. Cover and refrigerate at least 1 hour. Place your finely chopped chocolate in a medium bowl. In a small saucepan set over medium high heat, simmer the heavy cream and honey Remove from the heat and pour over the finely chopped chocolate and stir until melted and smooth. 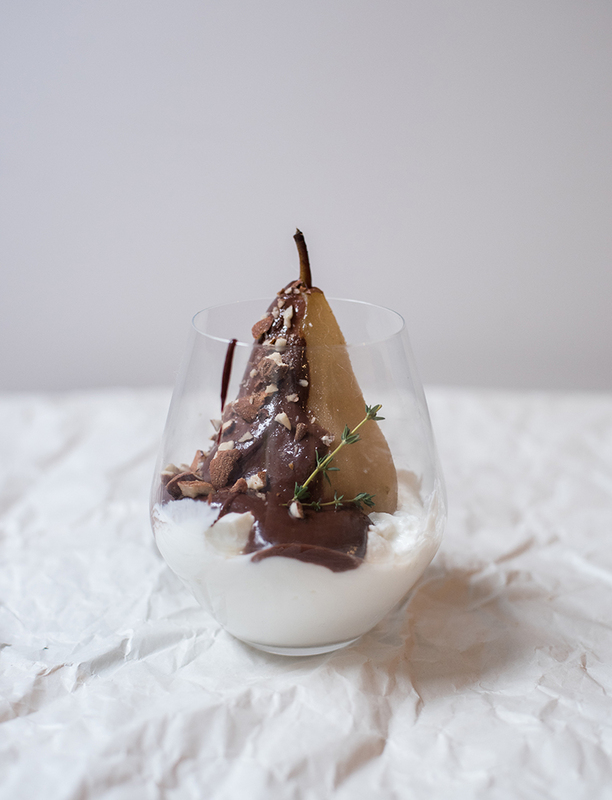 To serve, scoop the yogurt until a glass and place your poached pear upright. Drizzle your melted chocolate ganache and sprinkle with chopped almonds. Garnish with thyme sprigs and serve chilled. Enjoy!